When the betting odds indicate that a UFC fight is a mismatch, does that usually mean that it is? This article is written to prove that it does. The goal of this article is to help influence profitable betting decisions. It succeeds by including data on how big favorites perform on fight totals. What is a big favorite? A big favorite is when a fighter has odds of -300, or wider, to win. 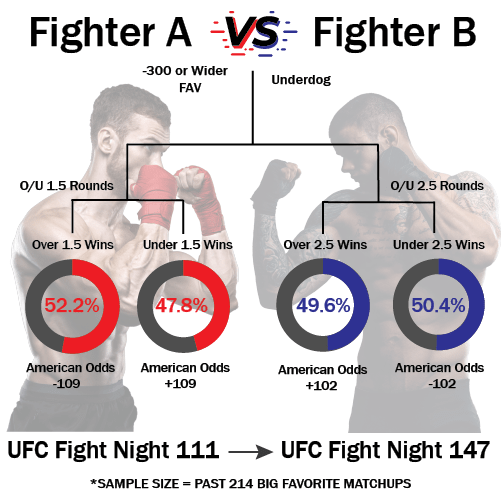 Therefore, in terms of percentages, a big favorite means that a fighter’s implied odds of winning are 75% or more. What are fight totals? A fight total is a bet on whether a fight will end before or after a certain length of time (1.5 rounds, 2.5 rounds, 3.5 round, or 4.5 rounds). 2. How often does an under cash when the matchup doesn’t have a big favorite? 3. How much more likely is an under going to happen when the fight totals are set at 2.5 rounds instead of 1.5 rounds, when a matchup involves a big favorite? 4. Are female big favorites more likely to cash the under than females that are not big favorites? 5. How do all the divisions compare in fight total statistics, when it involves UFC matchups with a big favorite? All of this analysis is solely concerned with data on the UFC promotion. All UFC betting lines for over/unders (also known as fight totals) can be found at 5Dimes. However, these lines don’t come out until a few days before the start of an upcoming UFC event. How often does an under cash when the matchup has a big favorite? The quick answer is 49.1% (105/214). That statistic takes into account data from UFC Fight Night 111 to UFC Fight Night 147, which is the past 71 UFC events. So, about half of the time, a matchup with a big favorite will result in a finish before the lined fight total. This result includes the sum of all the over and under variations (1.5, 2.5, 3.5, 4.5 rounds). What makes this statistic hold any value? What is value in this context? Value is when the probability of occurrence is greater than the implied odds specified from betting odds. The reason it holds value is because statistics are good for benchmarks. They help compute the trend of future probability by comparing the record of the past. Ultimately, the value in knowing that big favorites cash the under 49.1% of the time is that you can use this information for future decisions. For example, the American odds for 49.1% is +104. Knowing that, I’ll be a lot more hesitant to bet an under that’s a -200. How often does an under cash for UFC betting, when the matchup doesn’t have a big favorite? To gain a better perspective of how big 49.1% is, let’s see what the other side of the coin reveals. 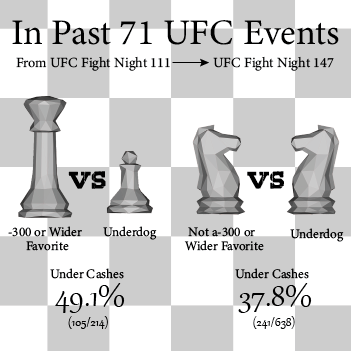 During the same span of UFC events (71), the under cashes 37.8% of the time, when fights don’t have big favorites. The under is 11.3% more likely to occur (win/cash) when a big favorite is involved. That’s enough to consider a big favorite more of a finishing threat. Intuitively, this makes sense. The wider the perceived margin in skill by oddsmakers, the more likely that margin results in a stoppage win. In other words, more finishes will result in more under bets cashing. Why is this statistic involving a 11.3% differential meaningful? If it’s possible to increase the chances for success in any endeavor by over 11%, why not take it? In UFC betting, you need every percent you can get. Every advantage equals more profit. Let me rephrase that, every statistical advantage equals more systematic profit. Although the sample sizes are different, the point of this comparison is to see how big favorites and non-big favorites performed on fight totals during the same amount of UFC cards, not fights. The reason for that is there are only an average of 3.0 big favorites per card (214/71) compared to 9.0 non-big favorites per card (638/71). If the sample sizes were to be the same, one would have to compare years of big favorites data to months of non-big favorite data. Because the sport has evolved so much over the past few years, the data would be less meaningful to compare a big favorite from 3 years ago to a non-big favorite from 3 months ago. To derive even more value from the previous statistic, you can subtract these numbers by 100% to get how often the over cashes. So, the result on the over for non-big favorites is 62.2% (100.0-37.8). We now have a benchmark for the over and under for matchups with or without a big favorite, but how can we appraise different fight totals for value? How much more likely is an under going to happen when the fight totals are set at 2.5 rounds instead of 1.5 rounds, when a matchup involves a big favorite? The picture below describes how likely the over/under 1.5 rounds cashes compared to the 2.5 round prop. As you can see, it would be more financially responsible to bet the under 2.5 and the over 1.5, when a big favorite is facing a big underdog. How do all the divisions compare in fight total statistics, when it involves UFC matchups with a big favorite? As you can see, most data points don’t have a sample size worth attaching any meaning to. 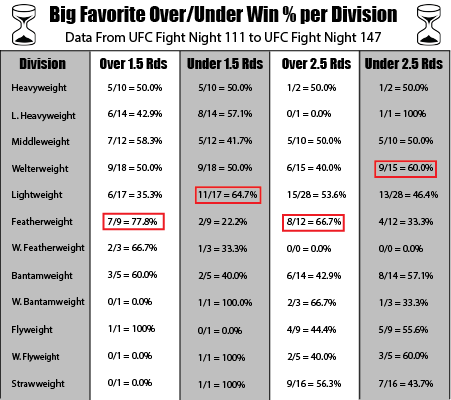 Since the past 71 UFC events has only had 214 big favorites, and there are 12 different divisions, there are not enough data points to go around. Although these sample sizes are small, a few divisions have some telling statistics. In order to highlight them, I boxed the most noteworthy ones in red. The over 1.5 rounds prop on UFC featherweight big favorites have won 7 out of the past 9 times. Knowing this, I would avoid betting the under 1.5 rounds prop when a matchup includes a featherweight big favorite. Are female big favorites more likely to cash the under than females that are not big favorites? Yes! From the same time frame used above (UFC Fight Night 111 to UFC Fight Night 147), there have been 33 UFC matchups with a female big favorite. Out of those 33 fights, the under cashed 17 times. That is a rate of 51.5%. Now, how often does a bet on the under win when the female matchup doesn’t include a woman that’s a big favorite? From UFC Fight Night 111 to UFC Fight Night 147, there have been 96 such matchups. From those 96 contests, only 23 of them payed out on the under. That is a minuscule rate of 24.0%. I expect the gap between 51.5% and 24.0% to close as I log more female big favorite matchups, but I see the statistical advantage to continue to exist. What makes these statistics impressive and potentially lucrative is that oddsmakers and UFC bettors expect the majority of female matchups to go to decision. Because of this expectation, the betting odds that a female UFC fight will make it under the designated fight total are usually around +200. There is a lot of value on a +200, if the probability of occurrence has historically averaged to be 51.5%. So, make sure to take advantage of those opportunities! 1. When betting an under, favor a matchup with a big favorite. 2. When betting an under, in a matchup with a big favorite, favor the over on a 1.5 rounds line and the under on a 2.5 rounds. Obvious, I know! 3. Female big favorites are more likely to cash a bet on the under than a matchup that doesn’t have a big favorite. Excellent goods from you, man. I’ve be aware your stuff previous to and you are just extremely excellent. I really like what you’ve acquired here, really like what you’re saying and the best way by which you say it. You are making it enjoyable and you still take care of to keep it sensible. I cant wait to read much more from you. This is actually a tremendous website.